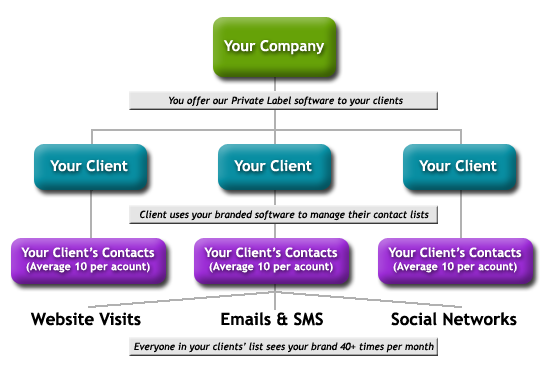 Do you like the communication and business management tools that ChamberZoom® offers, but would like your clients to see your own brand instead of ours? Whether your customer base has 50 people or 50,000, we can provide a solution that will help you grow your business. Contact us at sales@chamberzoom.com and let us show you how you can have your own business management software suite up and running in just a few weeks! You determine the domain name you want to use (just check if it is available) and ChamberZoom will manage it for you - from upgrades to support, we take care of everything! With over 25 VARs in the Americas, Australasia, and Europe, as a ChamberZoom VAR, you join an elite group of marketing professionals leveraging the most powerful software on the planet. ChamberZoom, a private labeled ChamberZoom brand for Chambers of Commerce, has a case study you may be interested in learning about. It's a success story about how in one year, the San Diego Chamber of Commerce increased sales 35% using ChamberZoom technology as the cornerstone of their growth strategy. Read the case study. Contact us at sales@chamberzoom.com for more details and pricing information.